Jacob Simmons was born in Illinois in 1863. At the age of 19, he married Halverina Skorpin, a young Norwegian girl with the same birth year as his own. After some years on a farm in Iowa, Jacob decided to join his brother-in-law, Ole Peterson, on south Whidbey Island. By now, Helverina and Jacob had a girl, Severine, and two boys, Alfred and Carl. Jacob ended up on a farm off of Deer Lake Road, intending to make enough money to support his growing family by logging giant cedar trees. In addition to logging, Jacob worked on the county road crew, served as county deputy sheriff during Prohibition days, and for a period of time ran a taxi service. 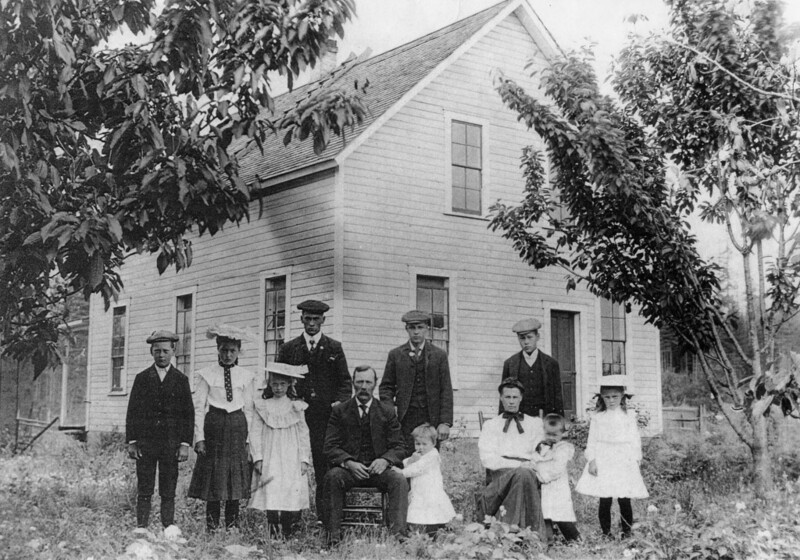 Jacob and Helverina were instrumental in the establishment of the first church on South Whidbey Island. For some time, they held church services in their home before St. Peter’s Lutheran Church could be constructed. Even after construction, a Pastor from Everett would come to perform services and spend the night at the Simmons home. In 1925, Helverina preceded Jacob in death, while he passed on in 1936. They are buried in the church cemetery at St. Peter’s Lutheran Church which they helped to build in Clinton. Descendants of Jacob and Helverina are strongly established on South Whidbey Island to this day.